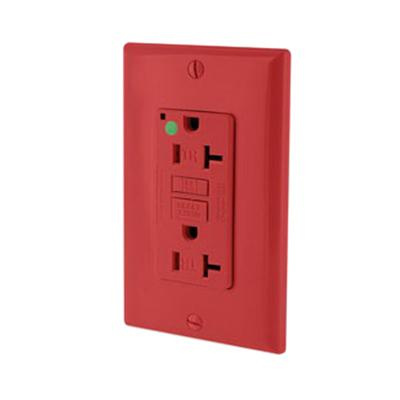 Leviton SmartlockPro® Slim-line Series Hospital grade 2-Pole Tamper-resistant self-test GFCI receptacle in red color, has current rating of 20-Amps and voltage rating of 125-Volts. This self-grounding receptacle withstands short-circuit rating of 10-Kilo-Amps. This 3-Wire receptacle accommodates 14 - 10-AWG solid or stranded wires. It has brass contact for optimal signal conductivity. Receptacle has brass-hot, green-ground, silver-neutral color-coded terminals for easy user identification.